Posted By Carlos On February 19th 2017. Under Annotated Bibliography Tips Tags: ACS Citation Guide, acs citation style guide, acs style guide citation . Do You Need an ACS Style Guide Citation? Getting your citations right within your text and your bibliography is not easy without an ACS citation guide. But you must be able to get it totally spot on for your academic writing if you want your work to be accepted. Whether you are writing a paper for your degree or submitting to a journal your formatting has to be exactly according to their very specific requirements or your writing will simply be rejected. 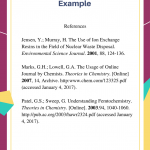 An annotated bibliography is a list of the different works that you have referenced during your research. It can be a stand-alone paper in its own right set to test your research and analytical skills or more commonly it will form part of a larger research paper. The annotation will summarize and analyze the work that you are citing so that the reader will get an idea of what it is about and its importance to your own work. The American Chemical Society (ACS) style of formatting must be followed exactly within your paper if you want the work to achieve the results that you need. This style of citation is most commonly applied within papers in chemistry. Our advice and annotated bibliography samples will help you to better understand just how you can achieve this within your writing. 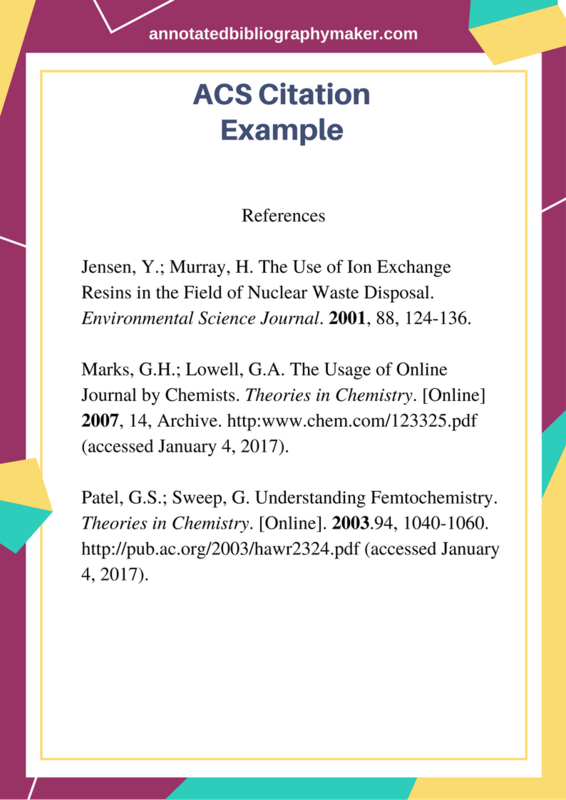 For some accurate IEEE annotated bibliography example, click here! Getting your writing completed within ACS style does not have to be difficult if you take your time and organize yourself right from the start of your research. The better that you prepare and the more comprehensive your note taking the more likely you are to get things right. Be clear right from the start as to what information you will need to collect for your ACS citations such as authors names, book titles, chapter titles, page numbers, edition and publication details, etc. Have a clearly defined research question to help focus your research into the right area so that you can find relevant literature. Use your library well to access previous research in your topic area in the way of published literature, research papers and journals. When using the internet use a scholarly search engine and select sites with care to ensure that they are trust worthy such as educational and government based sites. What is the work’s main argument, what is it hoping to prove? What methods did they use to gather their data and analyze it? What are the conclusions that they reached? Is the author an authority in this area? Have they published other works in this field? Who did they aim their writing at? Is there any bias to the writing? What weaknesses or flaws are present in what they have to say? In what way does it relate to other works you have referenced? How relevant is it to the main focus of your research? Try to take comprehensive notes to cover all of these points and if possible write up your annotations while the information is still fresh in your mind. Remove all writing errors through careful proofreading. As with all other academic writing you cannot afford to let mistakes in your writing and formatting to slip through. Smith, P. T.; Jones, J. C. Chemistry: Theory and Practice; Oxford University Press: Oxford, 1999. Author 1; Author 2; etc. The Article Title. The Journal Abbreviation Year, Volume, Inclusive Pagination. Should you be struggling with the ACS citation guide and need help with your writing just get in touch with our experts here today for effective and reliable support!